You can sit all day long gazing at beautiful Mill Farm in your very own revolving summerhouse -admiring the handsome 1911 farmhouse, its stunning gardens and surrounding countryside. Sitting in this idyllic location, the house still retains its characterful features as well as providing fabulous family accommodation and enjoying the wonderful landscaped gardens, which retain the original leat and mill pond. Located less than a mile from the popular village of Frogmore with its bakery, general store and pub, together with access to the Salcombe Estuary, Mill Farm is charm personified. The spacious and bright kitchen/breakfast room has south facing French doors out to the gardens and there are handsome separate sitting and dining rooms. Additionally, the house benefits from an extensive lower ground floor which provides space for a workshop, hobby/craft room, store room, utility and further storage. On the first floor are four charming bedrooms – the master bedroom facing south over the gardens together with an en-suite bathroom. The gardens create a magical setting for the house, with a paved stone terrace adjoining the property providing a wonderful alfresco dining area. Lawns then lead to beautifully planted flower and shrub borders, whilst water lilies and irises flourish in the mill pond. 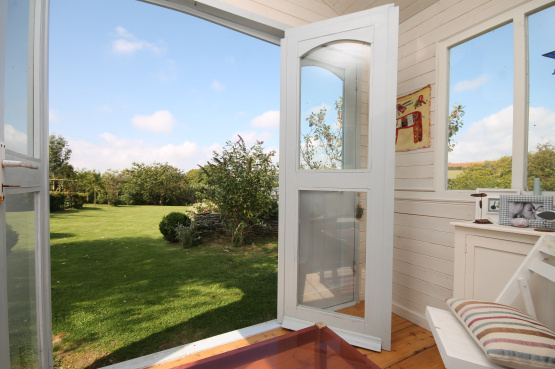 At the top of the garden is where you will find the amazing revolving summerhouse for hours of relaxation and enjoyment.